The Haryana Government has admitted before the Punjab and Haryana High Court that the “action taken by the Palwal Market Committee with the help of the police to demolish properties of the family of RPI MLA, Karan Singh Dalal is indefensible”. The Punjab and Haryana High Court, in a significant judgement today held that the clause for debarring a firm from doing business with the government for ‘unbusiness-like dealings’ would become operative only after a contract has been executed between the parties. The Haryana Punjabi Sahitya Academy organised a state-level poetic symposium and honoured writers here yesterday. A discussion was held on 'Agan Gatha', an anthology of Punjabi poems written by Arkamal Kaur, a Punjabi poetess. All posts of the Kurukshetra University Teachers’ Association except that of treasurer and Executive Committee members will have direct contest in elections scheduled to be held on November 21. Brave bus passengers and alert policemen foiled an attempt to set free three undertrials while they were returning after attending a court at Hansi today. Four policemen and an undertrial were wounded in the incident. There was a time when the football team of Ambala was considered to be one of the best teams in the country. And that team had defeated the formidable Mohan Bagan as well as Mohammedan Sporting of Kolkata nearly six decades ago. The SD Chatterjee football chowk, located near the War Heroes Memorial Stadium in Ambala Cantt, is a reminder of the rich and pristine glory of football in Ambala. It reminds of the heydays when there was passion for football here. Setting an example of speedy implementation of a government project, the Kali Paltan flyover is likely to be completed at least six months ahead of schedule. Senior Army and Railway officers today took stock of the progress of the work. An Additional Sessions Judge of Haryana, Dr S.K. Kapoor, who was scheduled to testify today before the Verma Commission of Inquiry set up by the state government to go into various aspects of prohibition imposed by the Bansi Lal Government, could not appear before the commission here. Work on Mandewala bed bars in the Yamuna started once again today in the presence of a police contingent. The work was hanging fire for the past three years. The Deputy Commissioner, Mr Vijayendra Kumar, the SP, Mr Rajinder Singh, and other senior officials of the district reached the spot in the morning to inspect the proceedings. The local MLA, Mr Chander Mohan, today accused the ruling Indian National Lok Dal of misusing government machinery for the Rajasthan Assembly elections. Addressing a press conference here today, he alleged that the district transport officers had been instructed to send vehicles to the neighbouring state of Rajasthan for the purpose of campaigning for the INLD. The two employees of the state Lotteries Department, who were booked yesterday for embezzling over Rs 83 lakh, had siphoned off the money while they were posted as sales officers in the department’s camp offices at New Delhi and Lucknow. Three wagons of a goods train derailed near Ambala cantonment railway station this evening. The derailment took place at about 6 pm. Faral, an obscure village in Pundri tehsil of Kaithal district in Haryana, will be the venue for a rally on December 6 to mobilise people for the World Social Forum meet to be held in Mumbai in January. The Haryana Government today retained the existing state advised price of sugarcane while it allowed the private sugar mills to pay the cane price as per the statutory minimum price fixed by the Centre. Mr Arjun Lal Kalra has been appointed secretary of the Haryana Pradesh Congress Committee. The appointment letter has been issued by HPCC president Bhajan Lal. Mr Kalra said he would work hard to strengthen the party. The district administration has formulated a plan to make this district a model district in the state, said Mr Vijayender Kumar, Deputy Commissioner, here yesterday. A five-year-old physically challenged boy and a 14-year-old girl have been reported missing in two separate incidents from this holy city for the past two days. The police has failed to trace their whereabouts. Ten CPUs of computers were stolen from the branch of the State Bank of India at Naraingarh late last evening. Mr Mahinder Pal Nagoli was today elected Chairman of Ambala Central Cooperative Bank. He said he would work for the interest of farmers. “I would strive to take the bank to greater heights so that the farmers can benefit from our services,” he said. He stated that the bank had one of the best recovery rates. The Panjokhra police has seized 60 kg of poppy husk from a crematorium of Barnala village close to Ambala city here today. According to information, someone had informed the police on phone that an abandoned gunny bag was lying in the funeral ground. This statement was made by the Haryana Advocate-General, Mr Surya Kant Sharma, before a Division Bench, comprising Mr Justice G.S. Singhvi and Mr Justice S.S. Saron, on October 14. Mr Sharma also suggested that the court might award suitable compensation to Mr Dalal and his family for “illegal demolition” of their properties. According to the Dalals, a 290 square yard plot was sold to Mr Shiv Singh in 1960 by the Palwal Market Committee, which issued a sale certificate in his favour in February, 1964. In July, 1964, Mr Shiv Singh sold the plot to the Dalals, who constructed shops on it. In 1966, the market committee filed a suit, challenging the sale to the Dalals. The suit was later withdrawn. According to the Dalals, the market committee resolved in 1967 not to take any further legal action regarding the plot. The Dalals allege that in view of the political rivalry between Chief Minister, Om Prakash Chautala and Mr Karan Singh, they sought a permanent injuction from a court of law in July, 2000. The court restrained the market committee from demolishing the shops. The then Collector of Palwal, who was also the Administrator of the market committee, passed an order of eviction against the Dalals on May 14, 2001. The same day this officer along with a large police force demolished the shops and took possession of the plot in dispute. The Commissioner, Gurgaon, also dismissed the appeal of the Dalals against the Collector’s order in 2002. The Dalals moved the High Court. However, before recording the final order, the Bench felt that it would be proper to give an opportunity to the state counsel (Advocate-General) to justify the demolition of the Dalals’ property “on the day the order of eviction was passed by the Collector”. The case was fixed for next day. On October 14 Mr Sharma described the demolition as “indefensible” in view of the previous day’s observations by the Bench. After hearing Mr Sharma, the Bench decided to provide an opportunity to the petitioners to file affidavits indicating the loss suffered by them on account of the demolition of their property. The case which came up for hearing today was adjourned to December 12 at the request of the Palwal Market Committee. Challenging the orders issued by the state of Haryana on September 1 debarring the petitioner from doing business with the government for three years, Indore-based Ives Drugs (India) Private Limited had earlier sought the quashing of the same. In the petition, counsel for the organisation had asserted that the petitioner had revised the rates for supplying goods as a result of which the respondents were not happy. They wanted the petitioners to stick to the original price quoted verbally by the organisations’ representative. After hearing the arguments in the matter and going through the documents placed on record, the Judges ruled: ‘‘We are of the considered opinion that the decision taken by the respondents was wholly arbitrary and violative of Article 14 of the Constitution of India’’. In their detailed order, the Judges further ruled: ‘‘We are of the considered opinion that the matter was still at the stage of negotiations. Therefore, the clause (regarding the breach of contract) would not have been applicable in the facts and circumstances of the case’’. Coming down heavily on the state and the other respondent, the Judges added: ‘‘Blackmailing or debarring a viable commercial firm has serious repercussions on the reputation of the firm. The state is expected to proceed with responsibility against such firms before such drastic action is taken’’. Speaking for the Bench, Mr Justice Nijjar concluded: ‘‘In our opinion, the respondents have treated the petitioners unjustly. The petitions is allowed and the impugned order is quashed’’. Dr Sudarshan Gaso of Ambala and Dr Sharanjit Kaur of Chandigarh said the poetess had tried to give a picture of the problems of women in today's society in a reader-friendly way. "The verses used by the poetess are very convincing", said the writers. While turning the pages of the anthology he read out a few lines of a poem to give an impression of the emotional state of mind of the poetess. Dr Pal Kaur, a Punjabi critic, described the anthology as 'miserable picture of women' in today's gender-apathetic society. Major Shergil, Director of the academy honoured Punjabi writers of state with cash prizes and mementos. Among others who honoured with cash prizes were Surender Kamboj for for book "Aadmin Ton Aadmin Tak", Balbir Saini for his outstanding contribution to literature; C.R. Modgil for his short story book "Ik Pulaang Aur"; Aatamjit Hanspal for his anthology "Sab Ton Vadda Rishta"; and Bhupinder Kaur for her contribution to literature. The academy also honoured students of various schools and colleges. The symposium was organised on the premises of the local Guru Nanak College. Mr Dhanpat Singh, Principal Secretary, Higher Education (Haryana), and Mr Lajvir Singh, Additional Deputy Commissioner of Karnal, were the chief guest and the special guest, respectively. All posts of the Kurukshetra University Teachers’ Association (KUTA) except that of treasurer and Executive Committee members will have direct contest in elections scheduled to be held on November 21. The Public Administration Department, Reader, Dr Ajmer Singh will face the Sport Department, Reader, Dr O.P. Gehlawat, for the post of president. Dr Virender Punia and Dr Ram Karan will contest for the post of vice-president. Similarly, there will be direct contest between Dr S.P. Gupta and Mr Gopal Prasad, both lecturers, University College, Kurukshetra while for the post of joint-secretary Dr B.S. Yadav, lecturer, University College, Kurukshetra and Mr Rajender Singh, working in University Library will be in the election fray. For the post of treasurer and Executive Committee members, Mr Vivek Chawla, Lecturer, University College, Kurukshetra has already been declared unanimously elected to the post of treasurer while 16 Executive Committee members have also been declared elected unopposed. The Executive Committee members are Dr Jai Singh, Dr Hari Singh, Dr Inderjeet Narula, Dr S.C. Bhatia, Dr N.N. Mishra, Dr K.S. Antil, Dr R.K. Yadav, Dr Pradeep Suchdeva, Dr J.S. Bidhlan, Dr Babu Ram, Dr S.S. Tevatla, Dr Brijesh Sahni, Dr Shail Tiwari, Dr Mahender Pal, Dr Faqeer Chand and Dr Denesh Rana. According to Returning Officer, V.K. Sethi, the outgoing KUTA President, Dr Pradeep Chauhan and Secretary, Dr Suchi Samita will be special invitees to the Executive Committee meetings. According to report, four policemen and undertrials Pradeep Jamawadi, Pradeep Badala and Dalsher were travelling in a Haryana Roadways bus today. As the bus stopped at Jita Kheri village, four unidentified youths boarded the bus. They intimidated the policemen and tried to set free their accomplices. One of the four miscreants asked the driver to stop the bus at gunpoint while another threw red chilly powder in the eyes of the policemen. As the bus stopped, few other hooligans who were following the bus in a jeep attempted to set free the prisoners. They shot at policemen but it injured prisoner Dalsher. Meanwhile, passengers tried to nab the hooligans but they managed to escape in the jeep. The injured were admitted to Civil Hospital here and Dalsher was referred to PGIMS, Rohtak. The four policemen — Ramesh, Mahender, Ramphal and Sukhbir — who sustained injuries in legs and heads have also been admitted to the hospital. There was a time when the football team of Ambala was considered to be one of the best teams in the country. And that team had defeated the formidable Mohan Bagan as well as Mohammedan Sporting of Kolkata nearly six decades ago. 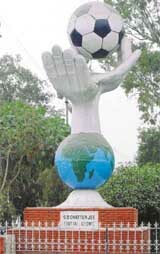 The SD Chatterjee football chowk, located near the War Heroes Memorial Stadium in Ambala Cantt, is a reminder of the rich and pristine glory of football in Ambala. It reminds of the heydays when there was passion for football here. Mr Manmohan Sarup Gupta, who was the secretary of Heroes Club for more than 12 years, said it was not till 1926, when football was properly organised and a District Sports Association was formed with M.C. Jolly as its founder secretary. “After Partition, there was no recognised football association from Amritsar to Delhi. The only exception was the Ambala Football Association formed by Jolly, who in 1951 became the president of the Punjab Football Association,” he said. “In recognition of this glorious and unexpected victory of a team from a small town, the Lord Bishop of Lahore, on request, ordered a playground to be given, on a long-term lease basis to the Club. Unfortunately, the club could not retain the playground. The Heroes Club under the stewardship of S.D. Chatterjee, affectionately called Dada, won more than 30 trophies,” he said. Over a period of time, more football clubs were formed. The clubs included Edwards, Golden, Royal, Areans and Union. Regular tournaments were held between the civil, the Army and the Air Force teams. In 1941, a class one Football tournament “AI `V’/ National Challenge Shield” was started by M.C. Jolly followed soon by another “AI Heroes Ambala Football Tournament”. Both these events used to attract the best teams from all over the country. The participating teams included Hyderabad Police, Bangalore Blues, 5/8 Gorkhas, Air Force, Kamla Kanpur, New Delhi Heroes, Leaders Jalandhar, JCT Mill, Phagwara, BSF, Jalandhar, Punjab Police, Sikh Regiment Centre, Meerut, Frontier Club, Peshawar, Sutlej Cotton Mill, Okara, Quetta Sadaminian and Kohat & Karachi XIs. The year 1957 was outstanding for the Ambala Heroes when it defeated Mohan Bagan of Kolkata in Ambedkar Stadium in Durand Cup by two goals to nil. Ambala had other notable achievements to its credit when the Union Club in 1958 defeated Mohammedan Sporting at Patna by one goal to nil. It also defeated Leader’s Jalandhar in 1968. The well known footballers from Ambala include Satish Kumar, Siri Kishan, Nirmal Mukherjee, Bimal Mukherjee, Tilak Raj and Pawan Kumar. Incidentally, S.D. Chatterjee is considered by many to be the father figure of the sport in Ambala. Chatterjee started playing football at the age of nine and by 14 he captained BD High School, Amabla. He became Punjab University `Blue’ and while studying in SD College, Lahore, in 1931-32, he represented Delhi against Kolkata. Setting an example of speedy implementation of a government project, the Kali Paltan flyover is likely to be completed at least six months ahead of schedule. Senior Army and Railway officers today took stock of the progress of the work. The construction of the flyover is being carried out through the joint efforts of Col Punit Sethi, Commander Works Engineer, and Mr Rajeev Soni, Deputy Chief Engineer of the Railways. The funds for the project were released by the Ministry of Surface Transport. The flyover is an example of inter-departmental cooperation which will help in linking the two sides of Ambala cantonment, which was divided by the national highway. The flyover will reduce the number of accidents caused when vehicles tried to travel on the opposite direction. Colonel Sethi said work was being carried out round the clock. “When a task has been assigned to us, it must be completed efficiently and within the stipulated time. We have succeeded in completing nearly 80 per cent of the work and the flyover will be functional by February, 2004,” he said. Colonel Sethi said the Kali Paltan flyover would smoothen the traffic flow and provide good connectivity towards Allenby Lines. “The flyover will bring relief to the Ambala motorists who had to cross the GT Road,” he said. Mr Soni said a ramp from the railway ticket booking office side would be connected with the flyover so that the traffic from the GT Road could easily turn towards Allenby Lines side. The traffic headed from the Allenby Lines towards Delhi would also not face any problem. “The flyover has been synergised with the railway overbridge. So, the flyover now has the national highway passing under it as well as the railway tracks,” he stated. According to sources in the commission, the judge did not appear before the commission because permission is awaited from the Punjab and Haryana High Court. The testimony of Dr Kapoor has assumed importance because it is alleged that when he was posted in Rohtak during the days of prohibition, an attempt was made to kidnap his daughter by the liquor mafia. Dr Kapoor was dealing with several cases registered under the prohibition laws. An FIR was registered at the Civil Lines Police Station, Rohtak, under Sections 366 and 511 of the IPC in this regard. The case is currently being investigated by the CBI. Work on Mandewala bed bars in the Yamuna started once again today in the presence of a police contingent. The work was hanging fire for the past three years. The Deputy Commissioner, Mr Vijayendra Kumar, the SP, Mr Rajinder Singh, and other senior officials of the district reached the spot in the morning to inspect the proceedings. Officials of Behat Subdivision also reached the site and objected about the work being undertaken by the Yamuna Nagar district. On November 12, the Deputy Commissioner, Yamunanagar had written a letter to his counterpart on Saharanpur, explaining that Mandewala bar was necessary for Haryana since a number of villages down the stream were affected during the monsoons. He also said that problem only arises during the Monsoons and with the construction of the bed bars, villages in Uttar Pradesh would also not be affected. The local MLA, Mr Chander Mohan, today accused the ruling Indian National Lok Dal (INLD) of misusing government machinery for the Rajasthan Assembly elections. Addressing a press conference here today, he alleged that the district transport officers ( DTO) had been instructed to send vehicles to the neighbouring state of Rajasthan for the purpose of campaigning for the INLD. He said the Congress was sure to win with a thumping majority in all the five states that were going to the polls next month. He said that he had been touring Rajasthan and Delhi and Congress workers from Panchkula, Ambala, Yamunanagar would be sent to Delhi for assisting in the Delhi elections, while workers from the other parts of the state would be sent to Rajasthan. Expressing his displeasure with the sanitation facilities and the growing stray cattle menace, he said that eversince the Municipal Council was formed, the sanitation conditions had worsened and the private contractors engaged by the MC had failed to ensure a clean township or control the cattle menace. Mr R.K. Kakkar, Municipal Councillor, said that the Congress councillors now planned to take the issue head on with the MC authorities. Soon, a dharna would be staged in front of the MC office. Mr Chander Mohan alleged that there was no development in the rural areas of Panchkula. He alleged that the Government Middle School at Kulbewala in Pinjore was closed for the past two months as there was no teacher. Similarly, there was a shortage of teachers in Morni schools and demanded that a sum of Rs 13 lakh announced for the Pinjore Municipal Committee and Rs 15 lakh from Kalka Municipal Committee be released. Senior officials in the Lotteries Department said on condition of anonymity that while Ramesh Chander, who was on deputation from the Public Relations department, was the sales officer at the Lotteries Department at Lucknow, Jai Bhagwan was the sales officer at the New Delhi camp office. They said the duo, while serving as sales officers, had failed to give accounts of the money collected from sales. An FIR was registered against the two employees on the complaint of the Assistant Director, Lotteries Department, on Saturday. It is alleged that while Jai Bhagwan has misappropriated Rs 44,14,053, Ramesh Chander has committed a fraud of Rs 39,67,657. The misappropriation took place between June 2, 1993, and June 30,1997. Officials said earlier the department had camp offices in Mumbai, Bangalore, Ghaziabad, Lucknow, Delhi and Faridabad where lottery tickets were sold. As and when various state governments banned lotteries, the camp offices were closed down and now the department had camp offices in Panchkula and Faridabad only with a 105 weekly lottery draw scheme and a daily sale of Rs 1.90 crore on an average. They also said that this was not the first time that a fraud had been detected at the sales office. Similar frauds, where the sales officers had failed to account for the money, were detected in 1980, 1992 and in 1994. Following this, the powers of the sales officers have been curtailed and camp in charges and senior sales officers have been appointed and the powers distributed among them. A separate cashier has been appointed and checking of the cash has been computerised. Three wagons of a goods train derailed near Ambala cantonment railway station this evening. The derailment took place at about 6 pm. Three wagons of the goods train derailed during shunting at the goods yard. The train movement was not affected on the main line. Railway officials rushed to the spot. An official said the wagons would be put on the track soon. “The derailment of the three wagons has not hindered train traffic,” he said. He stated that the exact cause of the derailment was not yet known. Addressing a press conference here today, Mr Ashok K. Bharti, National Coordinator of the National Conference of Dalit Organisations (NACDOR), said the rally was being organised in Haryana in the light of the recent incidents of upper caste violence in the state. The lynching of five Dalit men at Jhajjar by a violent mob followed by the incident at Harsola village from where Dalit families were driven out by members of another caste had prompted NACDOR to organise the rally in Haryana. As many as 50,000 persons from Haryana, Punjab, Delhi, Himachal and UP were expected to take part in the rally. Mr Bharti said about 50 activists would assemble in Delhi on December 2 and set off for Faral on cycles to reach Faral village on the day of the rally. Former Prime Minister V.P. Singh will flag off the cyclists in Delhi. The Haryana Government today retained the existing state advised price (SAP) of sugarcane while it allowed the private sugar mills to pay the cane price as per the statutory minimum price (SMP) fixed by the Centre. The SAP — Rs 110, Rs 106 and Rs 104 per quintal, for the early, middle and general varieties of cane respectively — was decided in 1999 and has remained so since then. An official press note said the decision was taken at a meeting of the Haryana Sugarcane Control Board here. Among others, Mr Ashok Jain, Mr Darshan Lal Budhiraja, Mr Narendra Pal Singh Shera, Mr Virendra Gandhi, Mr Puran Chand Jaiswal, Mr Gulshan Chabra, Mr Darshan Singh, Mr Sudhir Jaiswal, Sunila Vig, Ms Neelam Sharma, Mr Suresh Trehan, Mr Naresh Chadha, Mr Vijay Sharma and Mr Shyam Manchanda have welcomed his appointment. He said five super markets and two auto markets would be set up at Yamunanagar and Jagadhri. A link road between the Jagadhri Aggarsain chowk and Kalanaur would be laid. Mr Kumar said all dairies functioning in the residential areas would be shifted outside the town by December 31. For this purpose, adequate land had been purchased. Pronouncing the orders, the Judges ruled: ‘‘We find no merit in the writ petition. The petition is dismissed’’. Taking up a petition filed by a city resident seeking directions to the state of Haryana, the Punjab and Haryana High Court and another respondent to appoint the President of the State Consumer Disputes Redressal Commission, a Division Bench of the High Court headed by Mr Justice J.S. Khehar, today issued notice of motion for December 2. According to sources, the boy Ravi was with his father on Friday in the Kishenpura area but went missing. His father Rameshwar first noticed that the boy was missing. He went around his neighbours and relatives to look for his son but failed to trace him. In the evening he lodged a complaint with the local police. The police has registered a case of kidnapping. Sources in the local police said the boy had been kidnapped for ransom. The boy’s grandfather has recently retired from service. His provident fund and other post-retirement perks might have prompted the boy’s kidnapping. In another case, a 14-year-old girl went missing since yesterday. A complaint had been lodged by the father of the girl, Radhey Shayam Verma, with the police at the Kurukshetra University campus. Mr Mahinder Pal is the son of Mr Nasib Singh Nagoli, who is general secretary of the district unit of the INLD. Mr Malik, MD cooperative bank, was present on the occasion. The Panjokhra police has seized 60 kg of poppy husk from a crematorium of Barnala village close to Ambala city here today. According to information, someone had informed the police on phone that an abandoned gunny bag was lying in the funeral ground. The police went to the funeral ground. A gunny bag and a plastic bag were found there. When the police opened the bags, these were found to be containing poppy husk. The police suspects that someone might have hidden these bags in the funeral ground temporarily. The village is located close to the Punjab border and a large quantity of poppy husk from Uttar Pradesh is smuggled to the Punjab area via Ambala.